This tutorial provides an overview on how to use TVM to map matrix multiplication efficiently on the VTA design. We recommend covering the vta-basic-mat-mult tutorial first. In this tutorial, we will demonstrate TVM schedule optimizations to break large neural network operators down onto smaller blocks to achieve computation within limited hardware accelerator resources. We start by programming the Pynq’s FPGA and building its RPC runtime. As a first step, we need to describe our matrix multiplication computation. We define the matrix multiplication as the computation one would find in a fully connected layer, defined by its batch size, input channels, and output channels. These have to be integer multiples of the VTA tensor shape: BATCH, BLOCK_IN, and BLOCK_OUT respectively. This computation is intentionally too large to fit onto VTA’s on-chip buffers all at once. Therefore in the scheduling phase we’ll rely on computation blocking strategies to break the computation down into manageable chunks. // attr [data_buf] storage_scope = "global"
// attr [weight_buf] storage_scope = "global"
// attr [res_gem] storage_scope = "global"
The matrix multiplication is by default too large for activations or weights to fit on VTA’s on-chip buffers all at once. We block the (1, 1024) by (1024, 1024) matrix multiplication into smaller (1, 256) by (256, 256) matrix multiplications so the intermediate tensors can fit on the accelerator’s on-chip SRAM. This approach is similar to blocking techniques applied to CPUs and GPUs in order to increase cache hit rate. Next we set the buffer scopes to the corresponding on-chip VTA SRAM buffers. We move the load loops into the matrix multiply computation loop to stage memory loads such that they fit in the on-chip SRAM buffers. Finally we annotate the load/store loop outer axes with the DMA copy pragma to perform bulk memory transfers on VTA. The last phase is to lower the computation loops down to VTA hardware intrinsics by mapping the matrix multiplication to tensor intrinsics, and mapping the shift, and clipping computation to the vector ALU. // attr [res_gem] storage_scope = "local.acc_buffer"
// attr [data_buf] storage_scope = "local.inp_buffer"
// attr [weight_buf] storage_scope = "local.wgt_buffer"
After specifying the schedule, we can compile it into a TVM function. We save the module so we can send it over RPC. We run the function and verify it against a numpy implementation to ensure correctness. Successful blocked matrix multiply test! 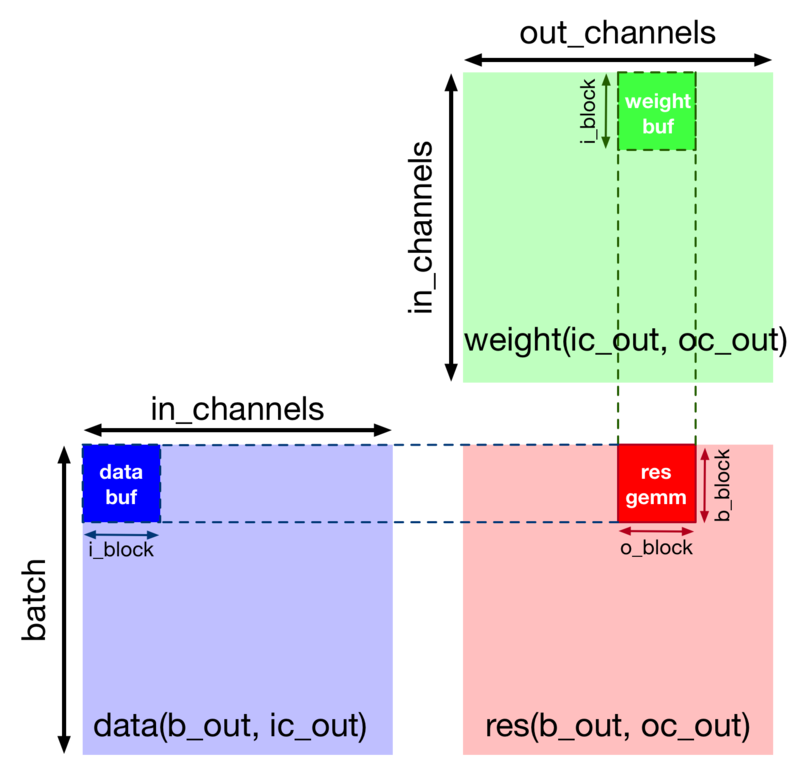 This tutorial demonstrates how TVM scheduling primitives can achieve computation blocking for a matrix multiplication example. This allows us to map arbitrarily large computation onto limited hardware accelerator resources.